My husband needed to sight in his muzzleloader for the hunt, so we took a trip to the range this weekend. Packed all the kids and the gear and the guns in the car and headed to an actual range. Usually we just go shoot at the hill outside of town, but for sighting in at specific distances, there’s nothing like a range where the distances are already marked and they have shooting benches, lead sled rifle rests, and big pieces of cardboard to mount your targets on their target stands. Nice. So this time, that’s where we went. 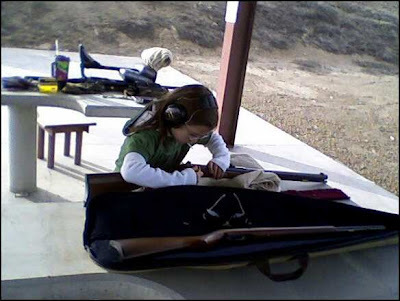 The other rule is that they have to wear their ear and eye protection if they’re anywhere near the range. If they have to take a trip to the restroom or get sent to the car, they can take them off. If you’ve got youngsters you want to get involved in shooting, invest in some kid size shooting glasses and earmuffs. The kids will be a lot happier about wearing them if they fit right. And until a kid is old enough to stick his own foam earplugs in, I just don’t trust those. They’re hard enough to get seated right in my own ears, much less someone else’s. If that’s all you have, they’re better than nothing, but there are earmuffs specifically designed for kids. Ours are the Peltor/AO Safety Junior Earmuffs. We got ours before they started making the pink and blue ones, so we have plain old black. These are designed to compact down to fit an infant and still stretch out enough to comfortably fit me. Nice, versatile pair of shooting earmuffs for not too much money. Stick some in the stockings this Christmas. Of course the rules of stay behind the shooter, keep your muzzle pointed to the sky or down range at all times, keep your safety on and your finger off the trigger until you’re ready to shoot, etc. all apply. Be consistent and make it fun. And take snacks. We’d have had a bit more fun if we only stayed the hour we first anticipated since I didn’t bring snacks for a whole afternoon/evening, but the sighting in took a while longer, so we stayed until dusk and shot up a storm. We ended up raiding the emergency kit in the trunk for some suckers. Here she’s got one in her mouth while she’s capping her rifle. I had to start spit lubing her patches for her once we busted out the suckers so they wouldn’t be all sticky! The kids all shot the .22 rifle and both the girls shot my older daughter’s muzzleloader. I even got to shoot a couple shots, but taking kids shooting is real similar to taking them fishing. You do a lot of loading and fixing jams and helping and watching and not much shooting, but it’s worth it to get them involved. 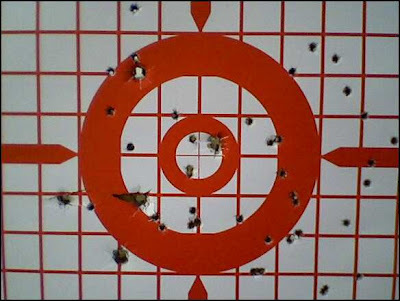 Here’s the kids’ warm up target that we then used for the older girl’s muzzleloader shooting. At 25 yards, the big holes are her muzzleloader shots. She has a .54 cal rifle and we use 20 grains of powder for her target shooting. The shots were all a bit left (except that one in the middle), but I expect by the time she’s big enough to haul that rifle through the woods on a hunt, she’ll be downright dangerous with it. 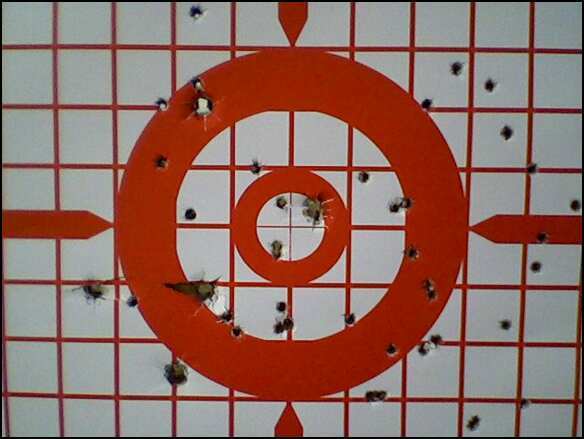 And of course, the .22 shots were all over the place (that happens when your 6 year old gets a turn or two). Fun stuff. So how are your local ranges? And do you shoot with your kids or grand kids? Nice to see good parental instructions and involvement – and all the safety issues covered. No range – but lots of woods and abandoned quarries here. Good for you and the kids taking them out to learn important skills. As far as snacks go make sure you have a method to wash your hands before you eat after you've been shooting. Especially .22LR or muzzle loaders using lead bullets. Muzzle loaders with jacketed bullets in sabots or jacketed bullets in rifles and handguns aren't as bad but they generally still put out some lead unless the bullets are completely copper plated. FMJ bullets usually have lead exposed at the base. I think the dangers of lead may be exaggerated but it is still not something to mess around with when you can easily avoid any possibility of danger. If the range doesn't have proper facilities then bring your own. We take an old liquid soap bottle like Palm Olive with the squirt top and when it is down to about 1/2 inch to 1/4 inch of soap left in the bottom we fill it up to the top with water and mix it up. When you need to wash your hands you put some of this diluted mixture on your hands and rub them, then rinse with fresh water from another jug. A surgeon also recommended this method to my dad for cleaning any cuts when you are somewhere without proper running water.